As embodied beings, we are surrounded and sustained in a constant flow of elements and energy that inform our every movement and gesture. Learning to see and skillfully navigate these currents, profoundly influences how we experience and are experienced in our day-to-day living. your life, your work, your relationships, your community, your physicality and your moment-to-moment state. Journey into the high desert terrain of Zion National Park with a group of heartful, strong and dynamic men. Heighten and expand awareness of movement, generating clarity and confidence in your actions. Bask in the beauty and intensity of a very awake place, similarly noticing and exploring the frontiers of your own internal landscapes. Recognize and anchor into deep consciousness in ways that will continue to be available to you for the rest of your life. Learn to circulate your breath, sexual energy and life experiences through-out your embodiment. Become more aware of the process of meeting, staying present with and skillfully navigating the continually changing currents of experience. Create a stronger relationship with that which challenges you, finding freedom and adaptability at your core. Enter focused considerations to unpack patterns of life that tend to go unaddressed. Explore the distinctions between structures that bring clarity and those which inhibit the natural and free spontaneity of your masculine genius. Celebrate, tussle with brothers in humor, and forge bonds that last a lifetime. Kolob Terrace region of Zion National Park - in a pristine, very remote, and privately owned valley, far from tourist activities. Scholarships available by application for returning students & men who need financial assistance. 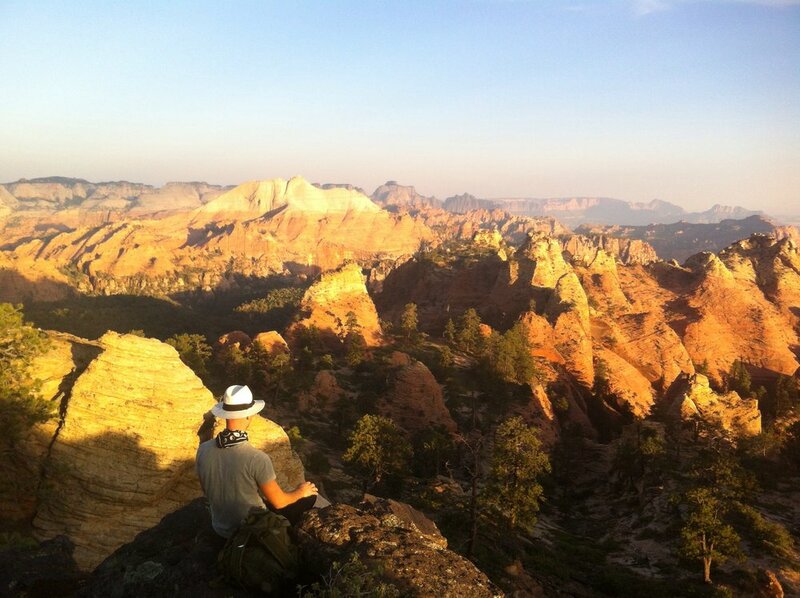 All photos are from the landscapes we will traverse in Zion National Park and surrounding private lands. Men's Elemental Immersions with Eli are offered in a strong spirit of honor, humor, and heart—bringing newly developed practices, as well as tried and tested ways to cultivate depth, openness, and embodied awareness. One of the ancient means of sharpening your masculine clarity, is in the company of fellow men who are dedicated to remaining awake and present in the midst of life’s challenges. Together with deep regard and strong practice, we will hold one another accountable to our own unique expressions of integrity, artistry, and love.